There are many reasons to practice good recordkeeping – staying organized, tracking specific project details/deadlines, planning for future business decisions, ensuring full legal compliance, and maintaining financial oversight all become much easier with proper document control. In most enterprises, the responsibility for managing records falls on administrative personnel. To help maximize your time and reduce stress, try using these basic tips to improve your company’s filing approach. Choose the right strategy: When establishing a set of recordkeeping policies and procedures, the first task is to determine what this system needs to accomplish. What problems need to be solved? Is the focus on clutter control? Does the office suffer from a lack of storage space? Are items improperly labeled? Do multiple document versions cause confusion among collaborators? There are any number of complications that can be significantly reduced or eliminated entirely by implementing a commonsense records management plan. Paper-Based: The tried and true practice of using folders and filing cabinets to save hard copies may seem quaint in this day and age, but sometimes the most basic method really is the best. Depending upon the size of the organization and its specific business needs, it may be helpful to keep things simple for everyone involved. Computerized (Paperless): The primary disadvantage of paper-based recordkeeping is the amount of physical space required. One easy way to solve this problem is by transitioning to a computerized (or paperless) approach. Many businesses use this strategy because, in addition to eliminating filing cabinets and storage rooms, managing records via computer is a great way to safeguard confidential information and enhance ease of access. Just remember to back up your computer system and store copies on different hard drives (at separate locations). Cloud Computing: There is no need to worry about computer crashes or other major failures if you store your important information “in the cloud.” Whether used as an alternative or a backup to computerized or paper-based recordkeeping, cloud computing is becoming more prevalent. The advantages are easy to understand: no software upgrades to install, minimal drain on storage resources (both physical space and computer memory), easy access to information from anywhere, and added peace of mind when it comes to the safety of your files should your computer suffer a catastrophic event. Security vs. accessibility: An important element of file organization that must never be overlooked is security. If your company handles a lot of confidential information, you must have a process in place to guard this data to make sure it does not end up in the wrong hands. Even if the majority of records are harmless, you still need to have protocols in place for the storage of employee information. However, too much security can impact functionality. If it is difficult for staff to access the files they need in a timely fashion, then the recordkeeping system becomes counterproductive. No matter what strategy you employ to protect your company’s materials, you will need to walk a fine line between sound security and ease of use. Use a meaningful and straightforward naming convention: Regardless of whether you choose to utilize a paper-based or computerized records management system, you must be consistent in the way you name files for your approach to be effective. There are many choices to make concerning the configuration of a file’s name (for instance, should the date be listed as YYYY-MM-DD or MM-DD-YYYY? ), but the majority of these options make very little difference. What’s most important is that you pick one and stick to it. The whole purpose of creating protocols for file naming is so that you can easily find what you are looking for at a later date. Without consistency, the organizational structure falls apart. Make digital copies: Just as it is a good idea to back up your computer on a regular basis, you need to create digital copies of paper files even if you rely primarily on a paper-based recordkeeping system. There are any number of disasters that can wreak havoc on paperwork: fire, flooding, and burglary are among the most common. Without digital copies, the company could suffer significant damage. It may be a bit of a pain to have to scan paper files into the computer on a regular basis, but it’s a small price to pay for document security. Don’t be afraid to throw away unnecessary items: A lot of recordkeeping is focused on the “keeping” part, but it’s just as critical to know when you should get rid of things. Too many unnecessary documents only create more clutter, which will bog down your entire filing system. Be selective about what you add to the company archives and perform regular audits to cull documents that are no longer necessary. Not only will this save valuable space, it will also cut down on the time needed to find important information. A quick word on retention requirements: While it’s important to minimize the size of your files, there are some items that must be kept for tax and compliance purposes. 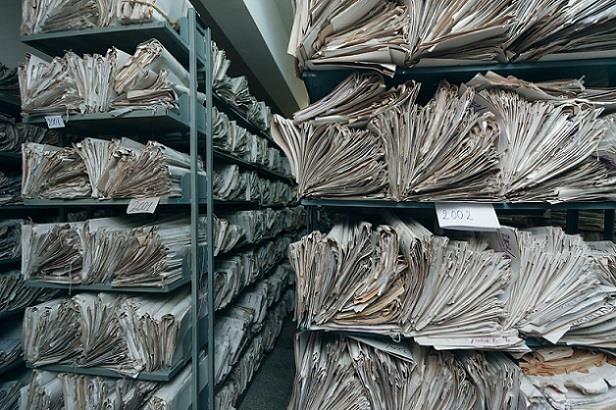 Corporate records, general ledgers, licenses/permits, insurance policies and claims, court orders, and annual reports are only some of the materials that must be stored permanently. Other documents like grant records, interim financial statements, employee expense reports, bank statements, expired contracts, legal memoranda, and payroll records (post termination) may only need to be kept for seven years. The exact requirements or recommendations differ by state and industry, so the best thing to do is consult an attorney and an accountant to determine the exact length of time that you will need to preserve certain business records.